New Diorama Theatre is lucky enough to have a talented and diverse board of trustees. From theatre professionals to members representing our local community, our NDT Trustees oversee New Diorama and help us plan for the future. James joined HS2 in 2017 and is responsible for the commercial development associated with the two new Birmingham Curzon and Interchange stations which will serve HS2 when it opens in 2026, as well as the regeneration and commercialisation of the land around the sites. Previously James was Head of Office Leasing at British Land for ten years with responsibility for the marketing and leasing of the office portfolio, and he was instrumental in establishing the New Diorama Theatre at Regent’s Place. James was also British Land's representative as our landlord for many years, and has extensively supported the company on their behalf through subsidies, introductions and charitable donations. Prior to joining British Land, James was a Partner in the West End Office Agency team at Knight Frank LLP for ten years, latterly including a secondment to Grosvenor’s development team to take responsibility for the leasing of their Central London development pipeline. Anna is an experienced regeneration professional with a strong background in commercial development projects and local authority partnerships – devising and managing engagement strategies and socio-economic legacy programmes. Anna has led British Land’s award-winning community programme and skills and employment activity since 2010, working in partnership with the public and private sectors, diverse communities and special interest groups. Her focus is on ensuring that British Land’s places and teams make a positive contribution locally and become considered part of their local community. She also collaborates with British Land’s suppliers, occupiers, local authorities and partners to help local people and businesses grow, and improve skills in areas where they are needed most. Tom has been an elected member of the London Assembly since May 2012. Having a longstanding interest in theatre, he led an investigation into the challenges facing small theatres in London on behalf of the Assembly's Economy Committee. This led to the Centre Stage report which sets out an action plan to help London's smaller venues. Prior to his election to the Assembly, Tom worked for the Searchlight Educational Trust - an anti-fascist, anti-racist charity that works with communities to fight racism and hatred. He is a patron of LGBT Labour and a trustee of the British Humanist Association. Tom was heavily involved in the New Theatre whilst at Nottingham University and has appeared in plays at the Edinburgh Fringe and Theatre503, but sadly his acting days are over. Phil is currently Chief Executive of the National Infrastructure Commission, set up by the Chancellor to provide expert independent analysis of the long-term infrastructure needs in the UK. Previously Phil Graham was Deputy Director in the Department for Transport and currently had responsibility for the development of Government policy on high speed rail. Previous experience has included leading the DfT Strategy Unit, and working as Private Secretary to the Secretary of State for Transport. Prior to joining the Civil Service he worked in the arts sector as Artistic and Company Director of Brute Farce Theatre Company. Utku manages technology teams and projects in Deutsche Bank. His 7 year journey in Deutsche Bank saw him develop software, manage projects spanning several countries, experience life in Moscow and eventually brought to him his new home, London. Utku always had a passion for art, actively drawing in his home country Turkey and even helped curate exhibitions while doing his Bachelor’s in Computer Science. He took to acting in London and is part of a comedy improvisation troupe. He performed in many amateur show cases and is excited to be able to apply his professional expertise to the development of NDT. He holds a Masters in Finance from Cass Business School. Sofie Mason comes from a predominantly commercial background having worked in sales in the 1980s and 90s in national newspapers and across a variety of legal, computer and lifestyle titles. She moved to the Royal Opera House in 1994 and stayed for ten years, initially maximising advertising revenue and then increasingly establishing partnership deals as well as managing the Box Office supervisors and staff under the title of 'Head of Sales'. In March 2004 she left the Royal Opera House and started her own sponsorship company, Theatre Partnerships, working on raising corporate and individual sponsorship for a number of organisations (Ballet Boyz, Escape Artists, Finborough Theatre, Old Red Lion Theatre and others). Sofie was employed as a consultant to artist management agency Askonas Holt to raise corporate sponsorship for the China National Beijing Opera at Sadler’s Wells, The Australian Ballet at the Coliseum, Amjad Ali Khan and Daniel Barenboim concerts at the Royal Festival Hall, a tour of Japanese Kabuki in the UK and a tour of The Soloists of the Royal Ballet to the Far East. In 2006 she launched OffWestEnd.com, a campaigning listings site that now promotes over 100 independent theatres in London, organises The Off West End Theatre Awards and supports writers with the 'Adopt A Playwright' Award. She has worked with mainstream producers such as Ed Snape of Fiery Angel and sat on the Development Board of The Tricycle. Sofie also works as National Official for BECTU, the UK’s media and entertainment union. Mark Ross has been Director of Diorama Arts, since 1991. He presently serves as trustee/director of numerous charitable organisations including The West Euston Partnership, (Camden: founding member), The Third Age Project, Choregus Productions (USA), Kodo Cultural Foundation (Japan). He was Director of the Cultural Olympiad (Lake Placid Olympics, 1980): Cultural events and closing ceremony, a Commissioner to UNESCO, in Paris from 1970-76 and is a Produced Playwright and Animateur/Director. Elly joined the National Theatre of Scotland (NTS) in 2011 as its first Director of Development, she sits on the NTS's Senior Management team and heads up a team of 4 fundraisers responsible for generating philanthropic and corporate support for the company's work. Her previous role was as Campaign Director at Peacock Visual Arts where she remains a non-executive Director and her other fundraising experience includes a focus on International Development as part of the University of Aberdeen’s £180 million Sixth Century Campaign. Prior to this as an Events Producer she ran the University's cultural engagement programme which included Word – an award-winning annual book festival. Elly is currently Director of Development at Good Chance Theatre. Mirium is currently a Client Advisor at UBS and was previously an Executive Director at Morgan Stanley. A big fan of theatre, Mirium was previously on the development board at the Tricycle Theatre. Artist, Playwright and Mountview Lecturer. Richard Shannon is a playwright, director and lecturer, working mainly in theatre and radio. His credits as a writer include: Sabbat (the story of the Pendle witches) produced in 2012 by the Dukes theatre, Lancaster and published by Oberon Modern Plays and The Lady of Burma (The story of Aung San Suu Kyi) which premiered at the Old Vic in London and went on to the Edinburgh Festival 2007, ran in London at the Riverside Studios and toured nationally. The play is published by Oberon Modern Plays and has been performed in Poland, Bangalore, Mumbai, Ireland and Norway. His other work includes: All Our Hellos and Goodbyes which starred Julian Glover as John Betjeman, Olympic Dreamer – the story of Dr William Penny Brookes, and Stargazer – a play for children, produced by Polka Theatre in London and the USA. Richard was Associate Director (New Work) at Polka Theatre for ten years and his productions at Polka include Shouting, Stamping, Singing Home by Lisa Evans. Richard was also one of the founding directors of Independent Radio Drama Productions. His directing credits include: Saddam’s Arms by Simon Beaufoy starring Nerys Hughes, No Boy’s Cricket Club by Roy Williams starring Donna Croll and The Hound of the Baskervilles starring Edward Petherbridge as Sherlock Holmes. In 2005 he directed Chuwudubelu, Preserved of God by Justin Butcher starring Ben Okafor, for BBC Radio 4. Richard also works as a visiting lecturer in radio drama and production at Goldsmiths’ College, University of London, teaches playwriting at Warwick University and the University of East London and drama at Newham College in Stratford, London. Rachel is the Associate Director of The Faction for whom she has directed Blood Wedding (part of Rep Season 2013), Othello and The Demetrius Project, she has also acted as Associate Director for their productions of A Midsummer Night’s Dream, Arabian Nights, Twelfth Night, Mary Stuart and Miss Julie. Her other directing credits include: Mr Kolpert (King’s Head Theatre), Refractions (Theatre503), Reggie & Gina, Just Say No (Themba / Johannesburg Schools and Prisons tour), The Lion’s Whisker, Tales of Wonder (Townships Schools, Johannesburg), The Silver Tongue of Aimee Ducatti (The Knapper Experience) and The Highwayman (Edinburgh). As Associate/Assistant Director she has worked on: Danny and the Deep Blue Sea (Southwark Playhouse, Directed by Che Walker), The Comedy of Errors (The Curious Room, Directed by Knight Mantell). Her film credits include: If (Channel 4 Sting Promo, NESTA Academy Award nomination) and Once (Short Film, NESTA Academy Award nomination). Rachel is also an Outside Practising Artist of V&A Museum & Young Vic Genesis Network director. Sarah is a Producer with a passion for contemporary theatre, regional touring and artist development. Presently she is a Projects Producer for Fuel. Prior to joining Fuel she worked as a Producer for Farnham Maltings, producing work nationally for Little Bulb Theatre, Victoria Melody, Up In Arms, and Jess and Joe Forever in co-production with the Orange Tree Theatre. Alongside Farnham Maltings Sarah was Company Producer for Home Live Art and Associate Producer for Jammy Voo. 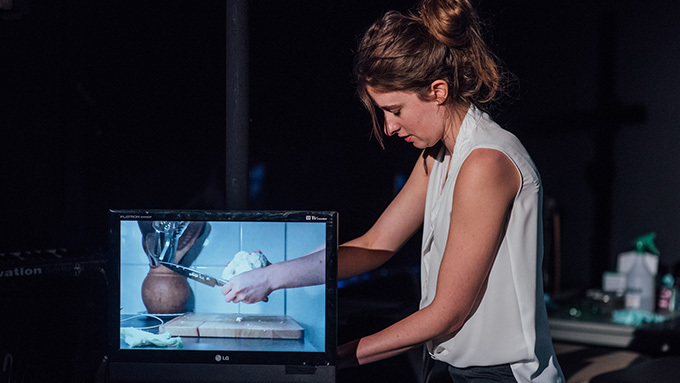 Previously Sarah was the Producer for Rhum and Clay, the Marketing Co-ordinator for touring initiative house, and in 2015 created digital touring resource tour-finder.org. To date Sarah has had articles published in Guardian Culture Professionals, Arts Professional and Arts Industry. She was a recipient of the Edfringe Producer bursary in 2012 and is a Clore Emerging Leaders Alumnus. Alongside producing Sarah is a visiting lecturer at the Royal Central School of Speech and Drama and a Trustee of New Diorama Theatre in London. Anthony is a partner at Rosenblatt Law and was, previously, a partner at Fladgate LLP, one of the UK’s top 100 law firms. Anthony qualified as a solicitor in 1989 and worked at Rowe & Maw and then Olswang where he became a partner before joining Fladgate LLP in 1998. Anthony's practice focuses on mergers and acquisitions, corporate restructuring and general commercial arrangements. He has a particular expertise and interest in the leisure industry and works extensively for clients in the hotel and advertising sectors. Anthony has extensive private interests in media companies and retains an interest in the arts.